When Jameel Syed embarked on what he believes is the first time anyone has attempted to visit 50 mosques in 50 days in the U.S., he saw it as his special call to the nation's Muslim-American community. For the 40-year-old marketing executive, born and raised in Ann Arbor, and a graduate of the University of Michigan, the project gave Muslim Americans an opportunity to share with others their stories in an effort to stop a surge of Islamophobia. Starting on April 3rd from a mosque in Plainfield, Indiana, Syed visited 11 states from the Midwest to the South in just six days. But then less than a week after he began, a prime example of what feeds Islamaphobic reactions hit the news--the guilty verdicts of Boston Marathon bomber Dzhokhar Tsarnaev. It only convinced Syed of the necessity of his "feel-good" mission. 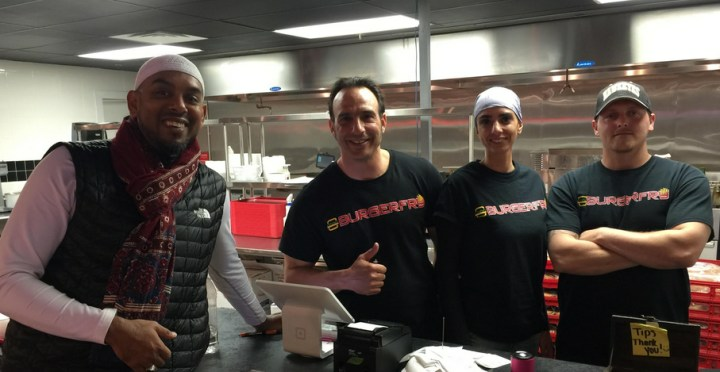 In Cedar Rapids, Iowa, Jameel Syed at a local burger joint owned by Muslims who are members of the oldest existing mosque in America. "Islamophobia is real, there is no question about it," Syed told NBC News as he traveled from Mississippi to Florida. "It's one thing people in our community are really aware of. And the big message here is we have to go out there and meet and interact with people. Give them the opportunity to let them know who you are. That's your best shot to dispel any myths, to breakdown any stereotypes, and to make a real dent into discrimination." Syed believes visiting mosques in every state, interacting with both Muslims and non-Muslims in any given locale, is the best way to humanize Muslims, and to offset any potential of negative sentiments toward Muslims, especially in the aftermath of the Boston guilty verdicts. The goal is to create a better sense of understanding. "Mainstream Islam is very different from those who would do [acts of violence] in the name of Islam," Syed said. "They're really taking over our religion…Anyone who knows Islam, knows it's a religion of peace…That's one of the main reasons I want to come out here and give Muslim communities and opportunity to tell their story. What happened with the Boston Marathon was horrendous. And we all protest against it…We speak out against it as a crime against humanity." Syed said he's not expecting to change anything about his tour because of the verdicts. His visits to mosques are well planned and centered around the prayer services and family life, both inside and outside the mosques. So far, Syed says he's been given a good look at the nation's growing Muslim believers. 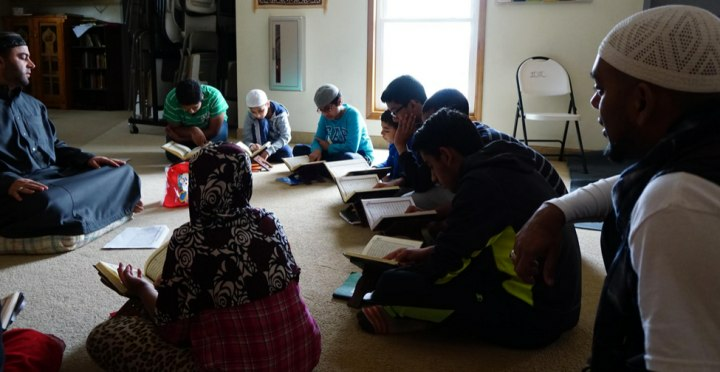 In the Midwest and South, Syed has noticed the surprising ethnic diversity of the American Muslim community, which the Pew Forum on Religion and Public life estimates could reach 6.2 million in 2030. At one mosque in Overland Park, Kansas, Syed said he was honored to meet with two of the highest level reciters of the Koran, Sheikh Dahee, and Shiekh Nasser after a Sunday school program. "There are just a handful of these guys here in the U.S.," Syed said of the men from Egypt he called master reciters. "This is a different approach in terms of educating the masses both internally and externally about the Muslim community….I think we can do some good." But sometimes, the visits are marked with sadness. 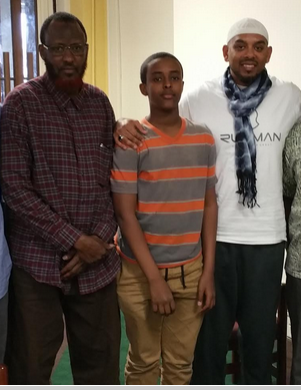 At the Al-Taqwa Mosque in Kansas City, Missouri, Syed met a large community of Muslim refugees from Somalia, including one of their leaders, Abdullahi Mohamud, an assistant to the imam and a teacher in the mosque, who suffered a tragic loss in December. Mohamud's son, Abdisamad Sheikh-Hussein, 15, was killed in a vicious hit and run crash that police are investigating as a hate crime. Ahmed Aden, 34, a local Somali of Christian faith, known to harass the community with anti-Islamic taunts, has been charged with murder. Syed said the incident didn't get as much national media attention as other recent cases, noting the coverage of the triple shootings in of Muslim students in Chapel Hill, North Carolina. But Syed said meeting the father and the members of the grieving family has been an early highlight of the trip so far because of the sentiments Mr. Mohamud shared. "He was naturally heartbroken," said Syed. "But he does not harbor nor is looking for revenge. He's looking to heal. He's looking forward to talk about the memory of his child and how he was raised. Something that is profound he said was 'we are not the only people who have lost a son like this.' There are Muslim and non-Muslim alike who have also suffered this way. So we should exercise empathy….I think it's a huge thing to say as a parent who lost a child to this kind of violence." For Syed, the tragedy offered an example of the kind of understanding that can come from his efforts across the country - the idea that American families have more in common than not. "When you don't keep families together, and you don't stay mainstream, individuals start to veer off," Syed said. "And that's when they can be victim to recruiters or influenced by someone who would do a heinous act. The lesson to my community is to make sure you stay mainstream, come to the mosque regularly, and get with the Imams elected by community members and go that moderate route." Syed's goal, which includes visits to Alaska and Hawaii, all in 35 days will take money, which he is hoping to raise through the crowd-sourcing site, GoFundMe. He is estimating it will cost about $50,000 for travel for himself and a photographer. He intends to shoot mini-documentaries along the way to share the stories they find. Already, just going from mosque to mosque in 12 states, he's realized there have always been obstacles to overcome just to get mosques built in some communities. But he's also finding mosques are just empty structures without their people, and that's whom Syed hopes to impact most. "There's still a lot of work to be done," Syed said with optimism. "So many people said this was something new, that this was a catalyst. This is a different approach in terms of educating the masses both internally and externally about the Muslim community….I think we can do some good."